It would be exhausting when you find the video downloaded from internet separates into several episodes. It’s inevitable to spoil the joy for enjoying the movie when the playing process interrupted again and again. For this case, you may consider merging those separated video clips as one whole. Absolutely, this solution can also be used to make a video compilation with desired video clips. To learn how to combine video clips, you can check the following parts where some effective methods are illustrated detailedly. Don’t be confused by the name of this program, it’s more than a traditional converting application but also features advanced functionality in video editing. Upon its intuitive interface, you will learn and grasp the operation tricks soon. With the help of this tool, you can easily trim, crop and combine video clips, add effects, watermark and subtitles on video, etc. Also, it empowers users to define the size for the output media file, which is quite considerate for your disk space. Follow the steps below to start merging. Download and install Video Converter Studio on your PC. Launch the program and then add video files. Enable the option of “Merge into one file”. Click “Convert” button to get start. 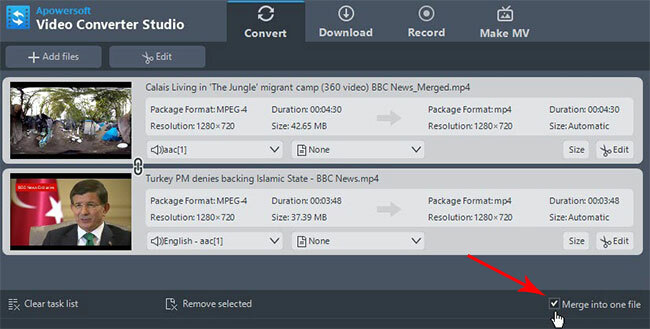 Before merging video clips, you can edit the video with the given editing options, such as trimming, cropping, adjusting effects and playback speed and many more. First of all, activate the video editor by clicking “Edit” button on the main interface. Trim unwanted section: You can trim the undesired episodes off by using the video editor. Select needed portions of the video, and then confirm the configuration by clicking “OK” button. Adjust playback speed: It allows you to speed up or slow down the video playback speed. To do this job, you can go to the tab of “Effect” and then adjust “Speed” option. Define file size: If you are worried about the file size after merging video clips, you can try to define desired file size. Press “Size” button on the main interface, and then input certain figure into the blank. 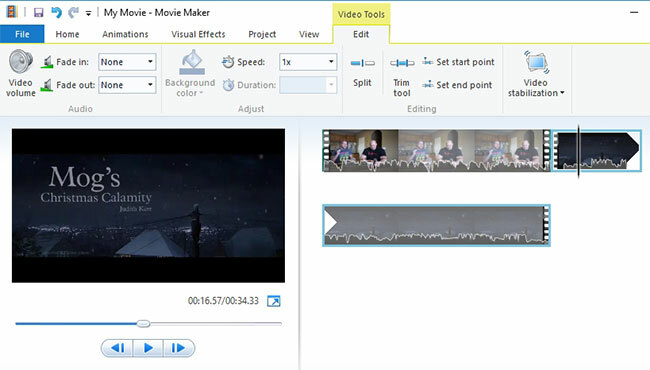 Windows Movie Maker can also serve as an efficient video joiner. This application is designed to provide some simple editing functions for users like trimming, rotating, merging audio and video clips as well as adding text and effects on video. Also, this program is quite easy to operate even for unexperienced users. Check the following instructions to learn how to use it. Drag the target video clips into the program. Go to the “File” > “Save movie” > “Recommended for this project”. Tips: In addition, it’s also feasible to remove unwanted sections of the videos. You may locate to the start time and then click “Split” button which is under the tab of “Edit”. Next, perform it again for the end time. Finally, press “Delete” button of the keyboard. To merge video clips, Freemake Video Converter is also a useful tool. This program provides a large amount media file formats for conversion and also allows users to edit the video files with the built-in editing options. You can use this application to cut, rotate, flip and combine multiple video clips into one with different transition effects. Benefiting from its simple interface, you will have no hassle to use this tool. Below are the exact operations of this program. Press the button of “Video” and then import target videos. Turn on the option “Join files”. Select desired format for the output file. Click “Convert” button on pop-up dialogue. Tips: Before converting, you can also customize the resolution of the merged video. Drop down the menu of “Preset” and then select a preferred resolution. Another video joiner is Any Video Converter which integrates the functions of video converting, downloading and editing. It supports various types of media file formats and allows users to convert and edit those files with no quality loss. In the meanwhile, the output video of this program also works finely on different portable devices including iPhone, iPad, PSP etc. Before joining video with this program, you may check the following steps first. Open the program and then press “Add video files” button. Browse and choose video clips from your local disk. 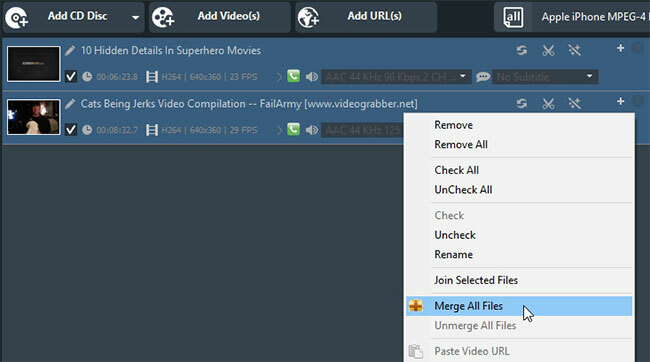 Select all items and then right click and press the “Merge All Files” option. Drop down the menu of “Output Profile” and then choose “Video Files”. Select a format that you prefer. Press “Convert Now!” button to start. All of those methods work greatly to combine video clips as one whole. Take an overall view on those applications, the Video Converter Studio is the most recommended for its comprehensive functionality in video converting and editing. Also, the video file won’t be too large with the smart function in defining file size.